By now you should have bought, washed & mixed your salad together. The next step is deciding on the dressing and with most salad greens this is usually a type of Vinaigrette. A vinaigrette consists three things - a good oil, acid (vinegar or lemon/lime juice) and seasonings which is combined with a chemical process known as emulsification to form a beautiful creamy dressing. 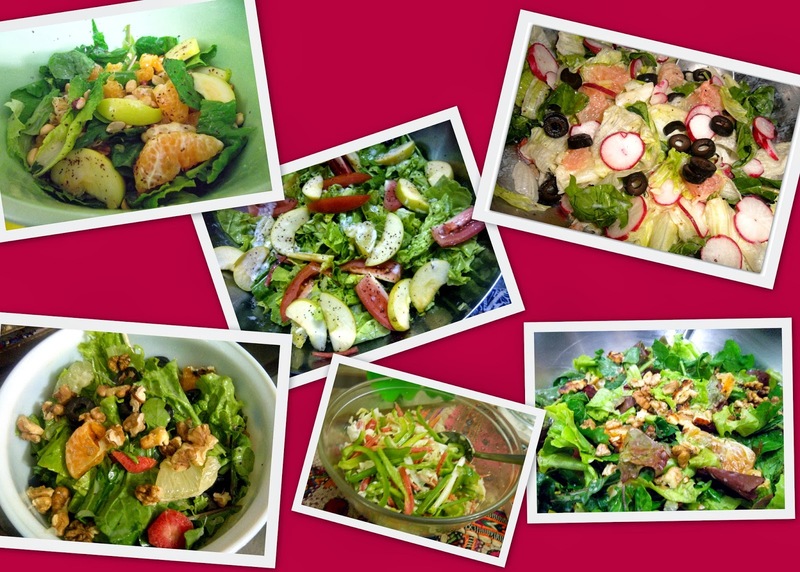 Following are basic dressings, with a few variations based on the type of salad greens that you decide to use. The standard ratio of oil to acid for a dressing is three parts oil to one part acid. For mild salad greens, a basic dressing of oil, acid & seasoning will work, however, for spicier salad greens like rocket or baby spinach, stronger flavors like mustard, garlic, onions along with some cream/yoghurt are required to complement the taste of the greens. But again, I will repeat the same thing - adjust the dressing based on your own preferences, and what is available in the fridge. I will be posting some recipes for salads in the future, and in almost all the recipes, I have used less oil and more yoghurt because I think the taste of extra virgin olive oil can be strong, so I would reduce from the basic recipe. Similarly, there are a number of additions and substitutions that can be made. Have included a list of basic recipes along with a list of simple additions in the end for experimenting with. 1. Depending on type of greens used, combine all ingredients in a blender for about 30 seconds till a creamy emulsion results. You can also add all the ingredients in a bottle, and then shake vigorously or add the ingredients in a bowl and use a wire whisk to mix. 2. Taste the dressing and adjust vinegar/lemon juice or seasonings if required. 3. Use 1 tbsp of dressing for about 2 cups of salad greens. The above dressings are base recipes, but you can always make additions/substitutions to them based on ingredient availability & your own taste. Sometimes I would add some lemon zest, or fresh herbs, or minced roasted garlic to leftover dressing just to change the taste. Herbs: Herbs can be added either fresh or dried to the dressing. If using fresh, then you can add about 1/4 cup of finely chopped mild herbs like parsley, basil or oregano for 1/2 cup of olive oil. If using stronger herbs like rosemary, tarragon or thyme then use about 1 teaspoon. If using dried herbs, then start with adding 1/8 teaspoon, and then add more if required. Fresh Garlic: Garlic flavor can be incorporated in three different ways depending on how strong you want it to be. If you want a stronger flavor, then you can mince/finely chop fresh garlic and add it in the dressing. Secondly, you can roast garlic in the oven which turns the flavor mild and sweeter. Thirdly, you can rub a mashed garlic clove around your salad bowl which will just give you a mild garlic flavor. Honey, maple syrup or sugar: If you want the dressing to be a bit sweet, you can add sweetener of your sugar. Start off small, 1-2 teaspoon for sugar & 1 tablespoon for honey, and then adjust more based on taste. Mustard: 1 teaspoon of good quality mustard, or 1/2 teaspoon of dry mustard can be added. Lemon Zest/Orange Zest: Zest of 1 lemon can be added for a lemon vinaigrette, making sure that you use lemon or lime juice for the dressing as well. Orange zest combined with fresh orange juice can also be used. Creamy Vinaigrette: Fresh or sour cream, yoghurt or mayonnaise can be used (about 3 tablespoon). Fresh cream is preferred over packaged as that has a much better flavor. Soy Sauce: Add 1 tablespoon of soy sauce to give an Asian flavor to salads; best if used with Asian vegetables like spring onions, Bak Choi etc.